Enjoyed our stay here, so close to disney we could here the fireworks at night ! Loved the layout of the house, only wish it had ceiling fans, as that is what we are used to. Got to Orlando earlier than I thought and called at 11:00am for early check in at 1:00 pm, but wasnt able to check in early at all. When they say 4:00 pm check in they mean it. Overall great place to stay ! We just wanted to drop you a line to let you know how happy we were with the house we rented from you earlier this month. It was absolutely perfect and exactly as you said it would be. It was conveniently located, very spacious and perfectly clean and in good repair. The heated screened-in pool was a real joy for my son. We arrived later than we thought and were really worried about getting in touch with someone to get our keys. There, in the lock box at your office we found our keys, a really good map to the house, and though we slept very late the next day, no one was beating on the door asking for payment. We couldnt have been happier. Everything was exactly as advertised, and that is rare in this day and age. Thank you for your contribution to making our daughters wedding at Walt Disney World a hassle-free and more enjoyable experience. Hi, I just stayed in 8442 Secret Key Cove at Emerald Island Resort. I just wanted to say how great everything was and how beautiful the home. 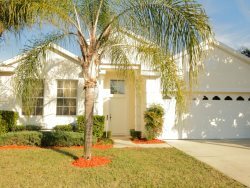 I have rented homes near Disney World for several years because my mother lives close by, but, the service from your management company and the beauty of this home were truly exceptional. The furnishings at this home were very upscale. The pictures do not do justice to how nice the furnishings really are. And the little touches were great! I particularly liked the size of the shower. It was much bigger than one finds at most homes. Also, the towel hanger on the shower was very convenient. Small touches such as this make this home a stand-out. The luxury bed linens were much appreciated. I have grown used to top quality sheets and it was sheer bliss jumping into them every night on vacation as well. It seems many places try to cut costs in this area, but not at this home! The mattress firmness was perfect and the pillows were the best! Thanks so much. The pool was crystal clear and though I paid extra to have it heated, it was worth it as the temperature setting was perfect for cool November evenings! All in all, I cannot say enough about the quality and value of this particular home. It cost a bit more, but when you see what you get for the price -- you realize the value you have received for your dollar. It was money well spent for a fabulous vacation home! Thanks again! Hi Jacquee: Thanks for the email - Im not sure if there was supposed to be a survey attached to it, and we didnt fill one out when we turned in the keys, but either way we had a great time at the house and would recommend your service to anyone - in fact we did several times to people we met at the Intl. Builders Show. For business people like ourselves attending or exhibiting at a trade show and bringing 3 of our staff with us, its a great way to save money - we would have needed to pay for 3 hotel rooms if we hadnt used the house. It also meant that when the show finished each day we could go back to the house, get some much needed beers, wine and snacks, and spend an hour talking about the leads we had got and what our strategy was for the next day. Its much easier to do this in the comfort of the house rather than a noisy bar somewhere. My husband and I think it is such a good idea we would even use one of your houses if we were coming down on our own, without our employees, as we find it much more relaxing than staying at a hotel. Thanks again for all your help and I look forward to using Dream Homes again - by the way, we are attending another show in July so well see you soon. HI! Yes, were now home and back in the minus temperatures...oh well. We had a fabulous time in Florida and LOVED our Dream Home! When we first walked in to our home I remember thinking WOW, what a beautiful home and WHY, would anyone ever stay in a hotel when a place such as this is available. Thanks again for providing us with a home away from home. We will certainly pass on to anyone, considering Florida as a destination, that Dream Homes is their best option. Hi Lance, We had to let you know that our vacation in Orlando was the best yet. Having a lovely home to go back to after a long day at WDW made our vacation that much better. We cant imagine staying in a hotel room ever again. The weather was great so we took full advantage of the pool every day. Our grandson enjoyed having his own room and plenty of room to play while us adults could just relax. We will definitely recommend your homes to others and already have a few people interested. Thank you again for all your help. Dear Donna, Last Friday, my family returned from our trip to Florida. I just wanted to thank you for assisting us with our accomodations. We were housed at 1007 Soaring Eagle in the Eagle Pointe community. The home and surrounding area were lovely. I was initially a little nervous making reservations online and sight unseen, but I would (and will) recommend this type of rental to anyone traveling to the Orlando area. The house was even nicer than we hoped to expect. Being on the small lake was also a nice surpise. We saw turtles, fish jumping, birds and even had a baby alligator visit!!! Our trip to Florida was certainly enhanced by the comfortable, homelike accomodations. There were 6 adults in our party and we never felt cramped or like we were running into one another as you would in a hotel. Once again, thank you for your assistance. We hope to be calling on you again next year for you help!!! Just wanted to let you know that we had a wonderful time in Orlando. The home we rented was just wonderful!!! We were upgraded to a 4 bedroom/3 bath home with a larger pool at no extra charge. My family and I were impressed at how clean, orderly, and well equipped the home was. Lance was very helpful and agreeable. I would definitely rent from you guys again. Thanks again. We wanted to let you know how wonderfully pleased we were with the home that we rented for our weeks stay in Orlando. The kids were as excited with the backyard pool as they were with Disney World. The beds were great, which meant a lot after 8-9 hours walking in a park. The home was convenient to everything we needed. I and my sisters family have several friends who are planning trips in the next few months and we wont hesitate to recommend you. Thanks again!! Hi Lance, My family stayed in one of your homes for a week in October and I just wanted to say that it was everything you promised. We were so thrilled and absolutely loved the house. The kids especially loved the pool! Weve told our friends what a great deal it was to stay there and forget staying at Disney! Thanks for making our vacation stay a great memory! We stayed in one of your vacation condos in Kissimmee earlier this month. We just wanted to thank you. The condo was perfect. It was the best part of our vacation. Thanks for everything. Just wanted to say that our 1st stay in Florida was fantastic. We came into Orlando very late, picked up our keys, found our condo so easy with all the instructions to everywhere we had to go on our arrival. We just loved the condo, the area and of course the pool and facilities. We had 4 21 year old kids with us and they enjoyed the game room and pool. We spent 3 days in the parks and were exhausted but being able to go to the pool anytime we wanted was so relaxing. The condo was beautiful and was perfect for our family. I really miss the palm trees and my husband told me that we are going to get 2 palm trees and put them beside our hot tub to make me think of our great vacation. I cant thank all of you for the best vacation we have ever had and cant wait to come back again. Two friends want some information on our stay, so I cant wait to give it to them. May was a perfect time to come, the weather was perfect and the lines at the parks were not bad. We will be back again and this time to disney. Dont know when but we will be back. This vacation was planned because our twin daughters turned 21 last Oct and promised them a special vacation. It was the best. Thanks again so much and God bless all. Lance, Just wanted to let you know that my family and I had a wonderful time in Orlando. The accommodations that you provided were great. The house was wonderful. We were pessimistic at first, but once we walked into the house, we fell in love with it. We were impressed with how clean and orderly everything was. We were also impressed with how accommodating you were. We would definitely rent from you again. Thanks again.! !